Marine Dealers, rental operators, campgrounds and people who move a lot of pontoons. THIS IS WHAT YOU WANT. Don’t be fooled by imitations. A few hundred dollars saved on a trailer like this will be lost in repairs or tipped boats. 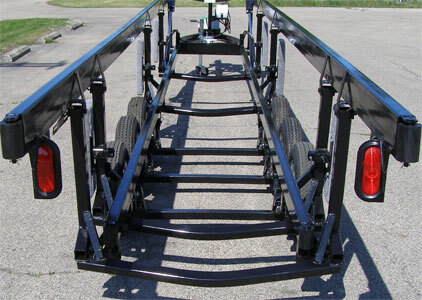 We’ve sold this trailer for over sixteen years and its moved hundreds of thousands of boats in hundreds of dealerships. Hydraulics are in the front of the trailer, down out of the line of sight of the driver. A remote controller with a 14’ cord and battery tray is included. YOU supply the battery. 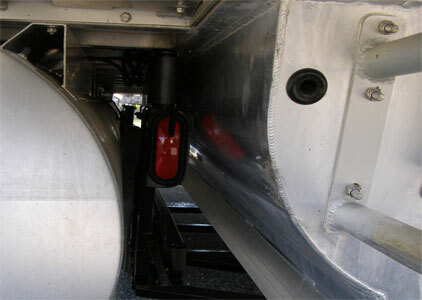 Rollers and plastic guides protect the pontoon tubes from damage. boats to the trailer when traveling. 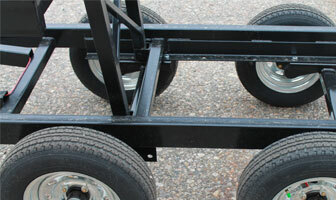 Torsion axles on narrow wheel base trailers are a benefit. 12” D range radial tires on galvanized rims give a smooth ride. The widest-deepest throat in the industry. almost every known production pontoon boat. Sixteen years in production we know where the stress points are. 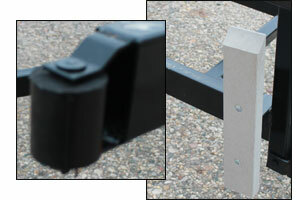 They are reinforced with welded steel bracing. 2700 lb. axles, 1520 lb. tire, trailer, weights 1000 lb. 2” x 4” frame, 5 cross braces, 4 lifting arms - Handles the biggest boats. Raised Height 40” Lowered 24”. 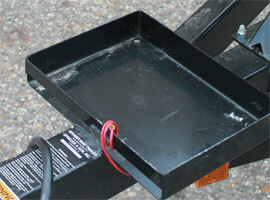 26” pontoons have ground clearance. Sits most boats on the ground. Comes with everything you need, except the battery. Battery Tray is included. Powder Cote finish. 1 year warranty on the trailer. the Hydraulic Center Lift pontoon trailer is for you. HYD BX-325 - 25’ bed 32’ overall length #6000 capacity $4495. HYD BX-328 - 28’-8” bed, 36’ overall length #6000 capacity $4795. the HYD BX-328 with a 28’ bed may make sense for many applications. Triple axle #1220 RADIAL tires on galvanized rims. 12" tires are standard, larger tires won't fit. Two hydraulic lifting arms raise the heaviest pontoon with ease. 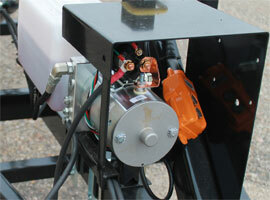 Trailers come with everything you need EXCEPT the battery. Our triple axle center lift triple tube pontoon trailer has been in production for four years. Our business has sold 90 and all are in use today. This is a proven product that has been used on thousands of triple tube pontoon boats. However, these trailers will not work on all brands of triple tube pontoons. Bennington has a model with an elliptical center tube that doesn’t have enough space for the trailer. 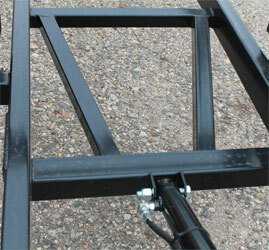 J.C. has a model with bracing between the center and outer tubes that prevents our trailer from fitting. But, the trailer will fit many of the triple tube pontoons. Bennington (except for the elliptical tube) Avalon, Bentley, Crest, Forest River, (Berkshire-South Bay-Xcursion), Harris Flote-Bote, J. C. (except the Tri-Tube) Manitou, Nautic Group (Sweetwater-Aqua Patio-Sanpan), Premier, Starcraft, Sylvan, Tahoe, Tracker, etc. 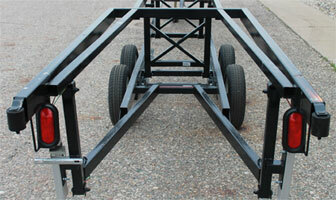 The triple axle triple tube hydraulic will also work with most 8’6” wide two tube pontoon boats.